This is how you escape from a bear attack. 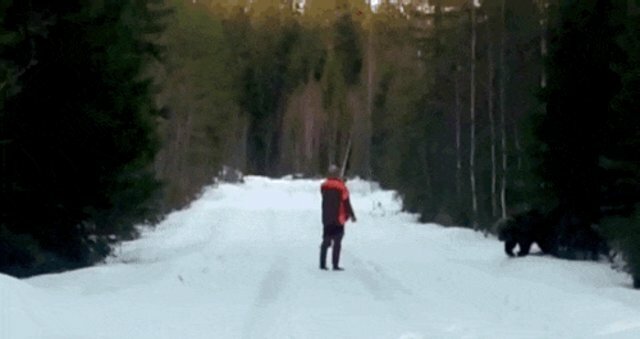 Ralph Perrson was walking with his wife and dog in the woods when he noticed his dog was barking differently, Swedish outlet The Local reported. Suddenly a large Eurasian brown bear ran out of the woods and charged at him. Like black bears in the U.S., Eurasian brown bears avoid humans and rarely attack unless provoked or startled, which this one probably was. There have only been two fatal attacks in Sweden in the past century. Perrson luckily kept his head on straight and both bear and human got away safely. Watch the video below to hear Perrson's bear-repelling scream - and see incredible footage from his phone.